I tuned in a movie on one of those cable channels that's overrun with bad commercials. One insipid ad followed another. Reading during the breaks I looked up and there I was, on the screen, larger than life (well, on our ancient 17" screen that's not so big), selling computer services. Squinting through my bifocals I discovered it wasn't me after all, just another geek with glasses repaired by generous layers of adhesive tape. Thick black frames - all taped - like those I wore in grade school adorned the faces of every actor in the ad. "Geeks On Call" (http://geeksoncall.com/), an outfit that fixes computer woes, uses the images to convince the public that these dudes are smart. Why the glasses? Why repaired so primitively? We geeks would never use a non-optimum solution like adhesive tape. Delicate soldering, maybe. Microwelding perhaps. Or maybe a special high-strength epoxy. But a crummy low-tech tape? No way. A couple of years ago while singlehanding to Bermuda in my little sailboat, I jumped out of bed late one night and stepped on my glasses, dumped there by bad weather. They were a crumbled, miserable mess of twisted metal and a cracked lens. No problem - being an engineer I always have a backup plan, so pulled an older pair from the chart table. There's not much to see in the middle of the ocean; the water looks pretty much the same no matter which direction one stares. I sailed on for three more days, finally raising Bermuda on the radar and then as a smudge on the horizon. And a smudge it was, a blur due more to the old prescription than distance. Entering St. Georges, a harbor I know intimately from so many trips there, shock hit when I couldn't see the customs dock. I eventually managed to tie up with the binoculars nearly glued to my face. Why are so many of us so blind? I attribute it to either genes (my dad is the �ber-geek; 10 minutes after he awoke from surgery last week we were discussing orbital mechanics), or reading to excess. As a kid I'd hide under the covers after lights-out, feeble flashlight barely illuminating a page of Tom Swift, electronics, geology, or science fiction. Today, give me a book and I'm never bored. Why do glasses project a geek image? 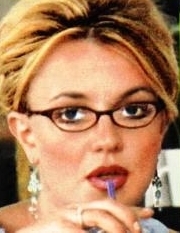 Why doesn't Britney Spears sport a nice set of black plastic frames? Wait a minute. she does! Add a little adhesive tape and she'll be ready to crank some wicked C code. Maybe glasses are making a comeback after all. It's time to buff up, wear tighter geek-clothes, accessorize and prepare to fend off the paparazzi. How long before Britney falls under the spell of an alpha-geek's glamorous magnified blue eyes? People Magazine will plaster shots of the happy couple on its cover, headlines screaming "Supermodel and Superprogrammer concatenate." Between the covers other pics will show her love-struck peepers peering through those thick lenses at the object of her devotion as he cranks out an awesome device driver. Fawning articles will assure the tabloid public that this match is forever. Till /dev/null do they part. We geeks know a secret: it won't be long before someone invents a box that puts all of the world's knowledge in your pocket. The user interface? Why, a heads up display, of course, projected on your spectacles by a tiny ear-mounted camera. Maybe glasses aren't all that cool today, but when this technology comes out, they'll be the rage. Finally we'll be chic. I can't wait to be in GQ.